Iain Henderson has realised his potential as a true Test match “monster” for Ireland, according to lock partner Devin Toner. Ulster powerhouse Henderson bulldozed straight through South Africa captain and talisman Eben Etzebeth as Ireland thumped the sorry Springboks 38-3 in Dublin on Saturday. The 25-year-old’s stunning muscle-flexing added another clip to his impressive highlights reel, but team-mate Toner insisted he is simply making good on a long-held promise. “Iain Henderson’s turned into the enforcer he always had the potential to become,” said Toner. “When he was coming through we didn’t call him the man-child for nothing, he’s a monster in the gym and a monster on the pitch. 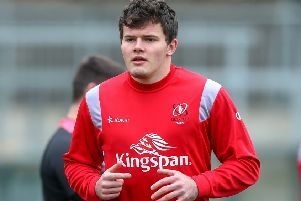 “And it’s fantastic for Irish rugby that he’s turning into that player we all knew he could become. “When you have someone who is the talisman of Etzebeth, he’s their captain, he’s renowned for being their physical man on the pitch. Henderson now boasts 33 caps in five years, and can count himself unlucky not to have broken into the British and Irish Lions’ Test team in the summer’s tour to New Zealand. Leinster and Ireland stalwart Toner believes Henderson’s rapid improvements hand Joe Schmidt’s side constant confidence boosts. “Hendy’s a special player, I’ve known him and played alongside him for a good few years now, and he’s just a special player,” said Toner. “I think he’s evolved his game, he’s a lineout caller these days as well. “So I’ll keep looking over my shoulder now to make sure he’s not nicking my spot. “But he gives confidence to the guys around him, you know he’s going to get over the gainline, you know he’s going to smash them in the tackle. Ireland racked up four tries in a record win over the Springboks, for whom head coach Allister Coetzee’s tenure appears on thin ice.